Ron's son Lee got in touch and asked if his father's memories could be added to the website. He provided three stories: two specific to Bath, the first about an amazing discovery when Ron was 11; the second (this page) covering the nights of the Bath Blitz when Ron was 13. The third story when Ron was 15 covers his memories of going to London to help repair the bomb damage there. This third story is provided as a file which will appear in a separate window. As most people know the air raids on the city of Bath was one of several attacks on historical British Cities. These were known as Baedeker Raids, so called after the German guide book of historical towns and cities of Britain. The first Baedeker raid on Bath was on a Saturday night at the end of April 1942. I was thirteen years old and living at 13 Waterloo Buildings, Widcombe (rear right of photograph). The sirens had sounded the alert and all our family was up and gathered downstairs and thinking that poor old Bristol was in for a hammering again. Our father worked for what was then referred to as the Corporation. He was a driver and he had to report to the corporation yard, collect his lorry and crew for duty as one of many rescue squads, whenever the air raid sirens sounded. So off he went and the rest of my family, my mother, three brothers and my sister took shelter in the basement of the house as the first bombs were being dropped. There we stayed listening to the screech of the bombs and the crumps of the explosions, scared to death and longing for the end of the attack and the all clear siren. Then suddenly it was all over and of course we were all thankful that we were safe, but aware that many others had not been so lucky. Soon after daylight on the Sunday morning our father called home to check on us and, over the ever present cup of tea, he told us that there was a lot of damage everywhere, but Widcombe had escaped quite lightly except for the Holloway area. Then he was off again to his rescue work saying that he would try to check on us again if possible. During that morning my brother Tony and I tried to wander around to see what was happening but many of the streets were covered with rubble and some were blocked off with special police on duty owing to some unexploded bombs in certain areas. We collected some shrapnel which was at that time a schoolboy hobby, and then returned home. All through that Sunday most people were of the opinion that the German planes would be back that night, and many families began trekking out to the countryside or to relatives and friends outside the city for safety. Our father did not manage to check on us that day and we all decided to stay at home and hope for the best. Hopefully it would turn out to be a quiet night. Some hopes! The Luftwaffe did return at dusk and with the air raid sirens sounding again our whole family were taking cover in the basement once more. This time the bombing and machine gunning seemed to be more terrible than the previous night and we were all quite scared. One particular explosion seemed really close. My brother remarked that it sounded as if the bomb had dropped into the canal and if that was so our house would be plastered with mud, and I remember making a joke about flying fishes. Just how long that particular raid lasted I cannot recall but suddenly it was quiet and then the all clear sounded. After a while our father managed to find time to look in on us and told us that more people were beginning to leave Bath for the shelter of the outskirts. He advised that it would be wise for us to do the same. He told us to go up to Claverton Down where, near to the cat and dogs home there were some haystacks where we could bed down for safety. So off we went warmly dressed and laden with blankets to trek up Widcombe Hill. My most valuable possession at that time was my stamp collection so I made sure that it was tucked under my coat. "Stay up there until I can manage to look in on you in the morning" he said as he returned to his rescue work. Like us, many people were also making their way up Widcombe Hill. When we reached Macaulay Buildings about half way up we stopped and looked back at the city. We could see most of Bath from there and on the opposite side of the railway station, (in the area which is now the bus station), the whole area was a mass of flames and because of the reflection on the river it appeared that all of Widcombe was on fire. It was a sight that I shall always remember. While we all stood there watching we actually saw the tower of St James’s church in Stall Street topple in a mass of flames. At that time I was a paper boy for Mr. Miller the newsagent in Widcombe Parade and I can remember remarking to my mother "If there are papers to deliver next morning, there might not be many houses left to leave them at". When we arrived at the top of the hill we learned from the people that the Claverton Downs Community Hall was packed with people sheltering from the raids, so we went on and found the haystacks that dad had told us about and settled down as best we could. The German planes did return and bomb the city again before daylight but I think most people were out of harms way. We returned home every day but for about a week we spent each night up at the haystacks. The next few days there being no schools open, my brother and I visited most of the bombed areas and continued our shrapnel collecting. One particular thing that I can recall was the W.V.S field kitchen which had been set up in what we knew as the circus field. It is now the Bath Cricket Clubs car park between North Parade Road and Ferry Lane. Around the perimeter of the field were huge cauldrons full of boiling hot soup which was being sent out all over the city for people who had no way of preparing meals because in many cases they hadn’t any gas or electricity supplies for heating. Everything was enveloped in smoke but the soup and bread rolls tasted quite nice. We knew because we had some. Eventually the schools opened again and things returned to normal. Bath was never again attacked after the Baedeker Raids. Citizens of the city got on with their lives. Most of the fatalities were buried in a mass grave at Haycombe Cemetery but some families opted for private burials. Lots of bomb sites had to be cleared up and many houses and other properties had to be rebuilt and repaired. This work went on for many years after. Widcombe escaped quite lightly from the Blitz. A bomb dropped in the grounds of Prior Park near the Palladian Bridge, one in the grounds of Widcombe Manor, another in the centre of Prior Park Road near what is now a garden centre. One dropped at Lime Grove in which the only casualties were a pair of nesting swans by the canal and another destroyed a rugby stand at the recreation ground. One landed on St Johns Church at South Parade which killed a Catholic priest who was sheltering in a doorway. The grounds at Prior Park being full of springs meant that the bomb crater quickly filled with water and although it was very cold it became a favourite swimming site for us young lads of Widcombe for some years after. Waterloo Buildings ran along the southern bank of the canal, between Spring Gardens (which started in Widcombe and bridged the canal where the canal joins the river) and the end of Ebeneezer Terrace. Ebeneezer Terrace still exists, although now it is a dead end, and Waterloo Buildings was demolished in order to construct Rossiter Road. Ron has remembered the three raids, though his memories of the times is a bit different from the official records. The first raid, on 25th April 1942, started just before midnight on the Saturday Night. The second at around 4:30 on the Sunday morning, and the third was just after midnight, in the early hours of the Monday morning. 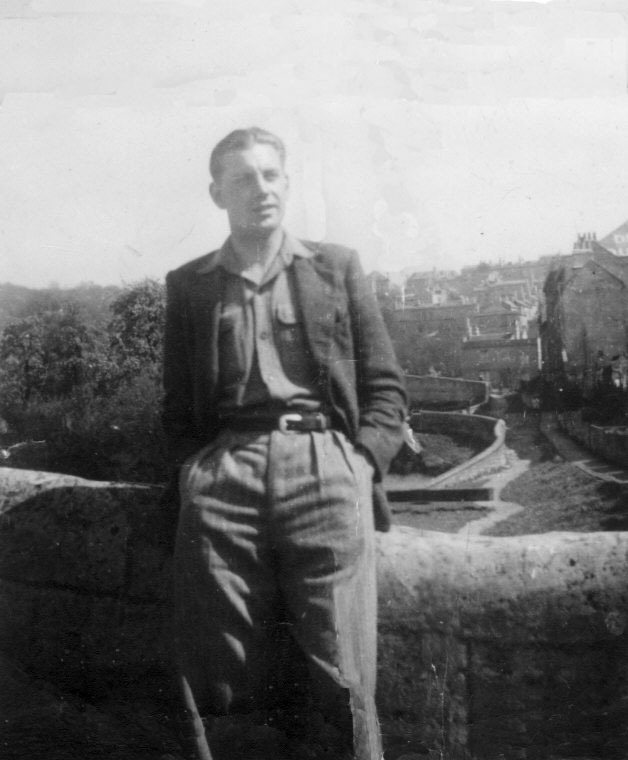 Ron Frost has also provided his memories of a discovery in Prior Park before the Bath blitz. And in a separate window his memories of going to London to help repair the bomb damage there.